Did you know there are islands in Toronto? You almost certainly did not. I didn’t before I moved here. But yep, right across from the skyscrapers of downtown in the Toronto Harbour (we’re talking Lake Ontario here), there’s a string of interconnected islands. The only way to get to or from them is by boat, and there are no cars allowed on the islands. The city runs a ferry service, or you can take a water taxi. Some of the islanders commute by canoe or kayak. There’s all kinds of stuff on the island (and for some reason Torontonians refer to it in the singular: the island): an amusement park, beaches (including one on the far tip that’s clothing-optional! ), bike paths, a marina, restaurants and picnic areas. There’s also a small and utterly charming residential community. The island was first inhabited in the late nineteenth century, and today it has 250 homes. 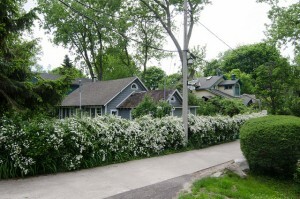 They’re mostly small, since they began their lives as summer cottages, and because there aren’t any cars on the island, there’s no need for streets—just paths. Sounds cute, right? But good luck moving there—the city operates a waiting list that is reportedly 25 – 30 years long. Dax Harris, the tech genius CEO hero in my new Indulgence release Sleeping With Her Enemy, was smart enough to get himself on the list as a kid, so he lives in a cute little blue cottage on the island. I cracked myself up as I wrote this book because when you think of Indulgence heroes and islands, you think: private, Caribbean, yachts. You do not think: tiny one-bedroom cottage, crazy neighbours building Rube Goldberg machines in the backyard, and schlepping your own canoe. But don’t worry, Dax keeps a penthouse condo on the mainland for parties and for impressing the ladies. In fact, he’s rather protective about his little house on the island—so much so that very few people know he actually lives there. So when he whisks his office-enemy Amy off to the island as after she’s left at the altar, she’s very surprised to see this side of Dax. But then, Dax is very surprising. Press Release: Entangled Publishing signs with Publishers Group West for mass distribution of print and digital titles of four imprints.